Sheikhupura is a district of Punjab Pakistan. The name of Sheikhupura is derived from a nickname of Prince Jahangir, who was known as Sheikhu by his father King Akbar. The present city of Sheikhupura was built by Mughal Emperor Jahangir in 1607. Sheikhupura is an industrial city. Old names of Sheikhupura are Kot Dayal Das, Qila Shaikhupura and Singhpuria. It is also named as Jahangirpura in Tuzk-e-Jahangiri. Sheikhupura name was changed by Mughal Emperor Jahangir from the name of this area, Virk Garh. SHEIKHUPURA was founded by Mughal Emperor Jahangir. Nearby Important and Famous Cities and Places are Lahore, Nankana Sahib, Narowal, Hafizabad, and Gujranwala. Sheikhupura also shares its borders with a city of Indian Punjab, Amritsar. Following are the famous tourism spots in Sheikhupura. Syed Waris Shah of Heer Rangha (Folk Tale) was born in Sheikhupura (Jandial Sher Khan) in 1706. 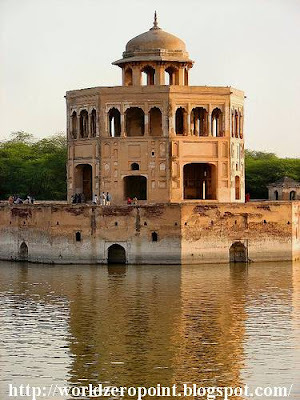 Hiran Minar or (Minate of Deer) is the landmark of Sheikhupura. It is situated in Sheikhupura, Pakistan. It was constructed by Emperor Jehangir as a monument to Mansraj, one of his pet deers. Unique features of this particular complex are the antelope's grave and the distinctive water collection system. At each corner of the tank (approximately 750 by 895 feet in size), is a small, square building and a subsurface water collection system which supplied the tank; only one of these water systems is extensively exposed today. Looking north from the top of the minar, one can see a patch of forest which is similar to the scrub forest vegetation of Mughal times, while to the west are extensively-irrigated fields, a product of the late nineteenth and early twentieth centuries, but similar in size and appearance to the well-irrigated fields of the Mughal era.